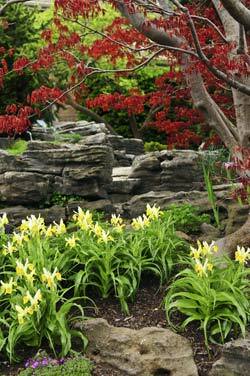 We often receive questions on rock gardens and have pulled some of them together on this page. Must Rock Garden Plants be Drought Resistant? No. There is no reason for that unless you live in an area where you have severe water shortage or restrictions or you do not have time for regular watering. Your choice of plants is quite extensive and if you provide good, well-drained soil and water as needed your plants will flourish. Must my Rock Garden have Lots of Sun? No. 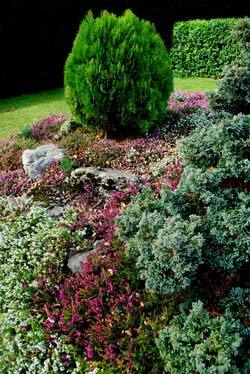 As much as you can create a rock garden in full sun, so too can you create one in dense shade. You will simply adjust your choice of plants accordingly. Will I Attract Bugs Hiding Under the Rocks? No more than you would have had in your garden anyway and if your rocks are partly buried, you won't know about them either. It's also important to note that not all garden 'pests' are detrimental to your garden - there are many that are essential to keep the unwanted pests in check. The key is to regularly inspect all your plants and to keep pests managed and under control - and not to poke your hand under a rock blindly! Any Rock Garden Ideas with just a Few Rocks? You can use bold rocks as natural accents in the garden and to break up the foliage. In the image below we've used a few rocks to "protect" a garden faucet from being hit by cars, to demarcate the borders of a bed and to soften the rigorous outline of the paving stones. You could also "supplement" your rocks with pots to create variations in height and to extend the rockery area. How do I Design a Formal Rock Garden? Designing a rock garden is mostly based on free-flowing, natural looking and asymmetrical lines and therefore does not fit one's idea of a structured formal garden. Our suggestion would be to incorporate hard landscaping in demarcated shapes and patterns in your layout, using materials such as paving stones and pots arranged in a pattern, structured walls to create tiers and the symmetrical placement of plants. Can I Plant Trees in a Rock Garden? Sure! You should consider trees though that do not have an invading root system and would still fit into your garden design as and when they mature. For example: there are some gorgeous conifers to choose from that do not grow too big, are evergreen and require virtually no maintenance. You should give the same consideration to your choice of shrubs too: Low maintenance, not too invasive and with a variety of color in the foliage. Can I Collect Rocks From Anywhere? No - you may be breaking the law! You could always ask a local farmer for permission to take some rocks or visit a building site in a rocky area where they may be excavating rocks that they don't want. Note: We'd love you to send us your rock garden pictures to feature on our new pages!